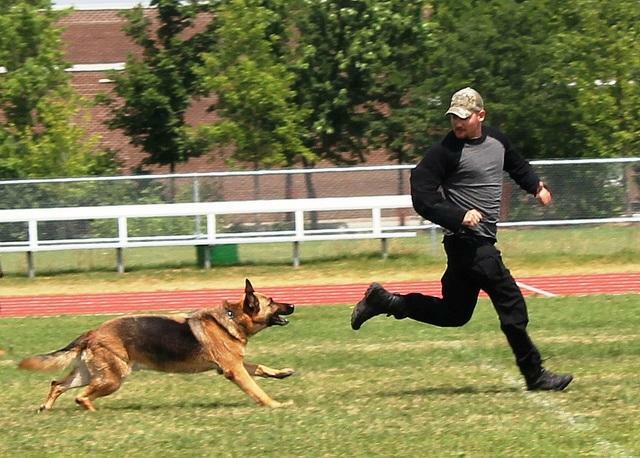 K-9 trials like this one were on display at the USPCA national competition where Florida DOC took first place in team competition and participated in nine individual events. Members of the Florida DOC’s Contraband Interdiction Unit brought home national recognition from the United States Police Canine Association, or USPCA, in Jackson, Mississippi. K-9 inspectors Robert Herbrand and Jonathan Cox attended the national competition with their respective K-9’s Ozzie and Bailey. They won first place in the team competition, out of 42 total teams. Cox and Bailey placed first in the overall individual competition for narcotic detection indoors, and fourth in car detection. Herbrand and Ozzie placed eighth individually. DOC spokesman McKinley Lewis says the K-9’s recognition is deserved for all of their hard work. “We’re extremely, extremely extremely proud of their accomplishments in these competitions. But that really – the competitions are, um, you know, obviously a fun part of what they do, but also a relatively small part of what they do,” Lewis says. The Office of Inspector General operates 20 full time canine teams all over Florida. The job of the Interdiction unit K-9s is to search prisons and other state facilities for illicit drugs and banned materials. The narcotic certified K-9’s help in investigations for local law enforcement agencies, as well as the Federal Bureau of Prisons.